Makala Cheung re-launched as KALA CHNG in 2018. She is a music artist from Knowle West, Bristol, UK and writes and produces Electronic Urban Pop with a Chinese twist. She’s released 3 albums; debut River (Bristol Live Magazine’s album of the month, Chinese New Year 2014), and follow ups Moon and Empress launched at her own ‘far east meets west’ Mini Moon Festival (2015+17). Her singles have featured on stations across the globe, and her radio play to date includes BBC 1Xtra and BBC Introducing in the West: “One of our favourite maidens of the music scene,” Sam Bonham, BBC Introducing in the West. 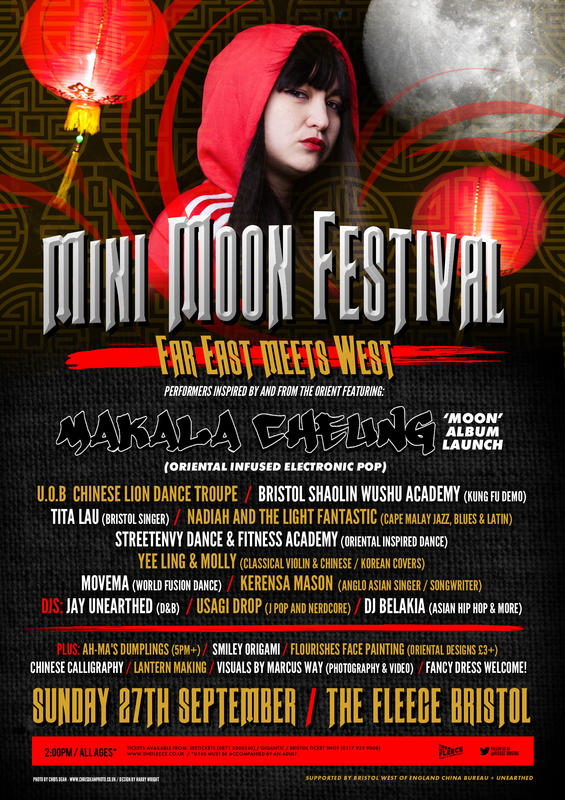 KALA CHNG (pronounced Kay-la Chung) has performed many headline and main stage slots including headlining the main stage at world famous Bristol International Balloon Fiesta, with her live electronic band. Previous performances include Upfest, Shambala, Dot to Dot, Redfest, Brisfest, St Paul’s Carnival, Keynsham Festival and Bristol Harbourside Festival. CHNG’s solo artist endeavour began in 2012, following a few years in a duo and featuring on local Hip-Hop and Grime tracks, before going on to learn to play keys and produce in the studio. Kala’s influences include M.I.A, Aaliyah, The Spice Girls, Destiny’s Child, Banks, FKA Twigs, Lauryn Hill, Dizzee Rascal, and Katy B to name a few. Referred to as reminiscent of Kate Bush, Madonna and ‘like a Chinese Lady Gaga’, she’s also been a Bristol Woman cover girl, named one of Bristol’s Happiness Champions and is a Culture Ambassador (West of England China Bureau). Her music and videos have featured on Bristol’s Big Screen at Millennium Square for the last two years during Harbourside Festival (pictured below). KALA also loves doing Shaolin Kung Fu, Street Dance, being in nature especially the woods, plus eating delicious food (and driving friends crazy with her vegan gluten free diet) and loves being around people, whether one on one with a best friend or socialising with stranger while watching a local show. Sometimes she doesn’t mind it quiet – going solo to an art gallery or reading a book…but just sometimes! In 2015 her work was exhibited at The Island as part of When Death Comes, which included poetry, lyrics, music and even music videos all responding to the topic of loss. The lyric design was in collaboration with Bart Designs, and videos with Marcus Way. She also performed a special more traditional acoustic version of her music at the exhibition event, one song is shown below. It’s about loosing her good friend and bass player (at the time). Debut EP “Who I Am” was released in August 2012. She has since released 2 more EPs (the latest of which incorporated Chinese instruments for Chinese New Year and so her oriental fusion was born), and released album River for Chinese New Year 2014, with Moon released for Chinese Mid-Autumn Festival 2015 at her Oriental themed festival – Mini Moon Festival. She’s received numerous press coverage, radio play and interviews, and performed with live band. Radio play and interviews include BBC 1Xtra, BBC Introducing In The West, BBC Bristol, BCFM, Ujima FM (chart show+more), and Passion. Previous and dep/ft live support: Sazzey, Greg Badman, Josiah Hartley, Becky Baldwin , Adam Darroch-Thompson, Dan Hill (aka Hugo Bass, in our hearts forever), Rob Ellis, Jordan Andrews, Mark Smulian, Johhny Skinns, Wolfy. Unearthed – DJing and co-production (Jay Unearthed), design & event photography. Bart from Jester Designs for logos. West of England China Bureau for Kisses video. John Seaman Photography & Snappy Andy for sending photos after various events they’ve caught me at. And not forgetting all the bloggers (linked on the site throughout), promoters, booking agents and DJs (especially Jelli Records, Nia Davis Ujima FM, Kilaze Bristol Homegrown Show, Bristol Music Show BCFM, Mike Shipway Bass Radio, BBC Introducing in the West).